There may be no better way to experience California’s natural wonders than setting up camp, building a campfire, and allowing all your senses to be awash in this state’s beauty. 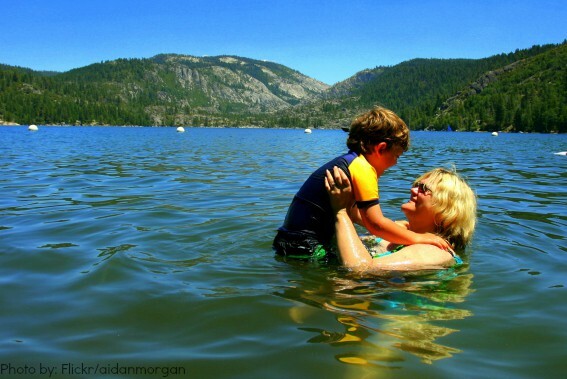 From the Sierras to the Pacific, come tour the best California campgrounds for families. 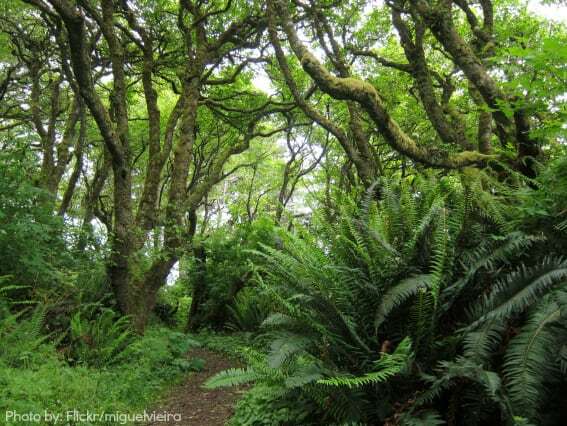 Delightful big trees and mossy ferns hug the Oregon border and the Pacific coast. Campgrounds here leave visitors in awe of the fresh air and light that filters through the redwood canopy. I highly recommend heading to the middle of a Redwood Cathedral Circle (a group of trees that spring up around an old stump) to simply just look up. Jedediah Smith Redwoods State Park, the northernmost campground distinguishes itself from the other campgrounds in the area with the availability of fishing and boating. Just a 20 mile jaunt southwest in Del Norte Redwoods State Park is seasonal Mill Creek Campground touted for its protection from the wind, beautiful scenery, and tide pools. Prairie Creek State Park is a find with its access to rugged coastline. For some amazing hikes and tide pools, head to Patrick’s Point State Park. Still on the hunt for more? Check out these campgrounds and activities in beautiful Redwood Country! The windswept coastline and forests continue as we move south. Sandstone formations and caves, prairies, and pygmy forests abound in Salt Point State Park. Be treated to an unobstructed view of the star-filled sky. Choose Woodside Campground for wind protection or Gerstle Cove Campground to be up close and personal with the elements. An hour north of San Francisco is Point Reyes National Seashore, which offers hike-in, bike-in, or boat-in campsites for the adventurous. A hop, skip, and a jump away is Samuel B. Taylor State Park, perfect for those who want to experience Pt. Reyes but prefer a car campsite under the redwood canopy. An hour south of San Francisco located outside of San Jose, is Portola Redwoods State Park. Take the nature trail to Portola Creek to search for remnants of clams and other fossils. Another great option in the San Jose area is San Mateo County Memorial Park where family-friendly hikes are plentiful. 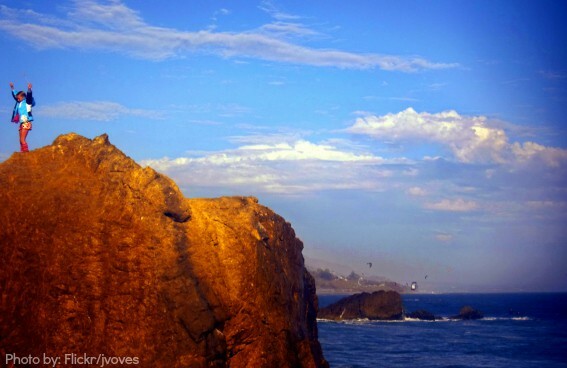 Enjoy a view of the bay from your campsite at Half Moon Bay State Beach Campground. Rounding out the Northern California beaches is Big Basin Redwoods State Park which is nestled in the Santa Cruz Mountains. 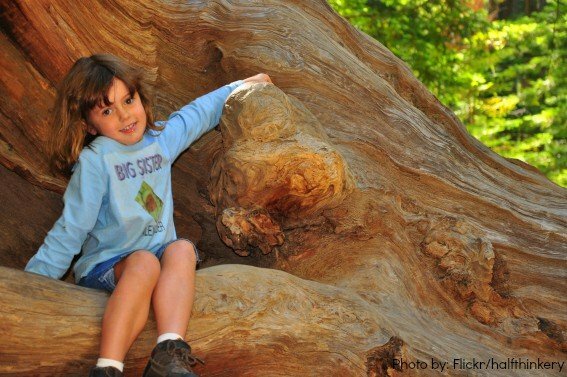 Here families will love the redwoods, waterfalls, and Jr. Ranger program. While at Big Basin, brave visitors can kiss a banana slug and get slimed! *Tip: Be prepared for changes in temperature from the canopy of the redwoods to the beaches’ open bluffs. Wind and fog are common throughout these campgrounds. 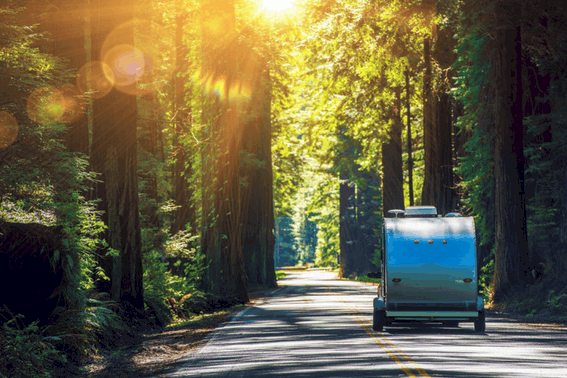 Be sure to check out these other great ideas for camping near San Francisco and through Northern California. The Western Sierras are teeming with beautiful mountain campgrounds. Near Lake Shasta, enjoy the waterfalls at both McArthur Burney Falls Memorial State Park and McCloud Bridge Campground or experience lakeside primitive camping at Castle Lake Campground. In Lake Tahoe, head to Camp Richardson where you can tent camp under the trees and still take advantage of all the amenities of this full-service resort. For a unique experience, nab a boat-in site on the banks of Englebright Lake located outside of Yuba City. Tap dance on the “big stump” and camp near a babbling creek in Gold Country’s Calaveras Big Trees State Park. Families rave about the lake, general store, and access to family-friendly amenities like movie-nights and espresso bars at Pinecrest Campground. 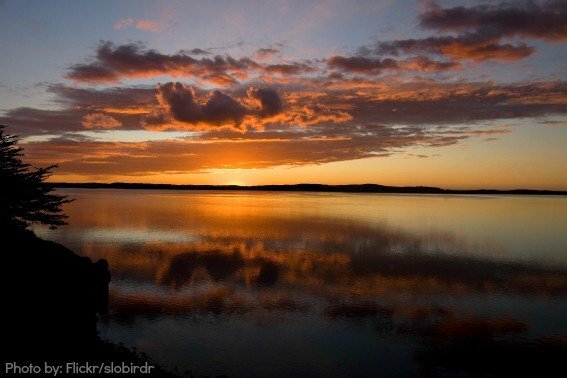 If you’d like to stay closer to the central valley, head to Lake Don Pedro for lakeside camping and incredible fishing. Let’s be honest, the campgrounds in Yosemite are all awesome! Sometimes they can be difficult to reserve, so check out these first-come first-served options for a last minute trip. In Kings Canyon National Park, amazing campgrounds are located around every turn. The most famous campground in Sequoia National Park is the large Lodgepole Campground where you can also catch a shuttle to take you to all of the park’s highlights. *Tip: This is bear country. Remember to store food and equipment properly to keep the bears and your belongings safe. Most campgrounds list their food restrictions online so families can plan ahead. The beauty of the Western Sierras makes them a very popular destination for nature seeking families. For a more secluded time in the mountains, head east. The mountain lakes, fishing, and high altitude canyons make for stunning trips. For a unique experience, head to Devils Postpile National Monument Campground. Made up of only 21 first-come/first-served sites, this campground is as close as visitors can get to the infamous formations without needing a shuttle bus. Just outside Devils Postpile is Minaret Falls Campground where some sites have views of the waterfalls and sit on the San Joaquin River bank. 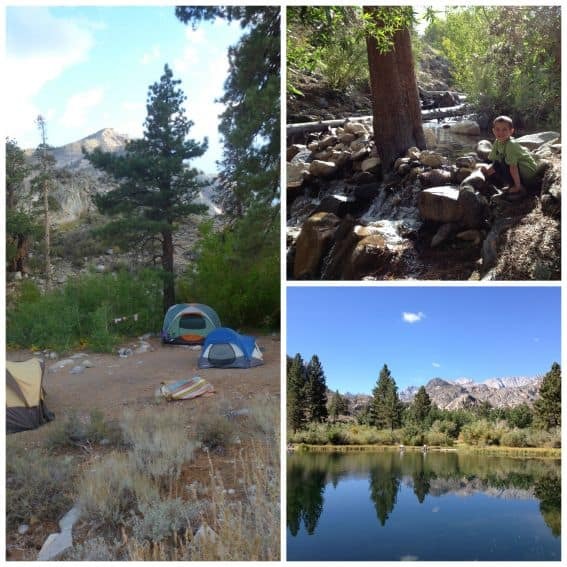 Pristine lake-side camping can be found at Twin Lakes Campground in Mammoth Lakes. For those who prefer full-hookups, try Mammoth Mountain RV Resort. While further south, the campgrounds that dot Bishop Creek Canyon delight fishermen, hikers, and nature lovers. *Tip: The majority of Eastern Sierra campgrounds are at high altitudes. It would be wise to take precautions by bringing extra water and lots of sunscreen. Check the weather before you go and take the time to acclimate to the environment. California’s Central Coast is perfect for those who seek chiseled beauty, sand, and surf. The tiny town of Big Sur can be found on the winding Highway 1. The perseverance it takes to get there is rewarded with campsites surrounded by towering redwoods, meandering creeks, and incredible views. Both Pfeiffer Big Sur State Park and Julia Pfeiffer Burns State Park (located within 10 miles of each other) are good options for families. Both are set with gorgeous backdrops and access to water holes. They also share one major con for families with young children: poison oak. So be sure to choose a campsite carefully, or make sure to teach the kids how to identify this plant. Looking for a stellar Jr. Ranger program, large sites, beach access, and trails? Look no further than family-favorite San Simeon Creek Campground. Quaint Morro Bay is home to Morro Bay State Park, a large campground set below a giant eucalyptus grove and the perfect place to camp and enjoy civilization. This campground is within walking distance of the Museum of Natural History, kayaking, golfing, and a short jaunt to the embarcadero. Pismo Beach offers three distinct camping options for families: Pismo Coast RV Resort for those who RV and enjoy a heated pool and other full amenities; North Beach Campground for a more rustic trip on the Pismo River; and Oceano Dunes, where adrenaline-junkies enjoy riding dune buggies on the sand. People drive quickly at Oceano Dunes, so this may be best for older kids. Outside of Santa Barbara is El Capitan State Beach, a beach haven with amazing views of the Channel Islands. See Trekaroo kid-friendly reviews of Central Coast campgrounds. Southern California beaches offer idyllic sights along the Pacific. Both Pt. Mugu’s Sycamore Campground and Leo Carillo State Park Campground in Malibu offer beach access and shade from giant oak trees. There are miles of hiking trails between the two and through the Santa Monica Mountains. Leo Carrillo’s beach is renowned for tide-pools, caves, and rocks, while Pt. Mugu has sandy beaches and dunes. Heading to Southern Orange County? Moro Campground located in Crystal Cove State Park sits high on a bluff overlooking one of the most beautiful beaches in Southern California (and my personal favorite). Hang out close to the sand at Dana Point’s Doheny State Beach Campground and check out some tide-pools as well. San Clemente State Beach Campground offers incredible surfing and interpretative programs. In San Diego County, there are four family-friendly campgrounds on the ocean. At San Elijo State Beach Campground take to the beach for a surf session and then head to the local taco stand to refuel. Enjoy the beach at South Carlsbad State Beach Campground without worries of forgetting something because a camp store is located on the property. Enjoy a natural beach setting, volleyball, and swimming at Silver Strand State Beach Campground on Coronado Island. For an upscale camping experience, Campland by the Sea on Mission Bay offers resort-style camping sites and full family-friendly programming. All of these Southern California beach campgrounds book quickly and take reservations months in advance. Here are some other options for Southern California campgrounds where reservations are not required. With so much focus on Southern California beaches, the mountains that frame the area are sometimes overlooked. But the mountains of Southern California offer some incredible places for families to camp. Big Bear Lake is home to Serrano Campground. 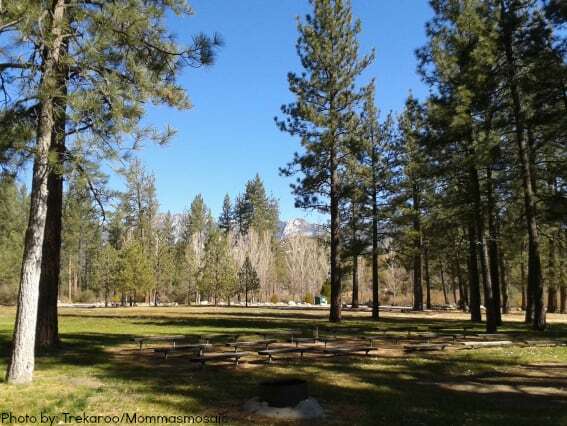 Located on the banks of the lake, this campground sits along the Alpine Pedal Path which offers miles of hiking trails and the Big Bear Observatory. A little closer to the valley floor is San Gorgorino Campground located outside of town which makes it less crowded and more private. Over in the San Jacinto Mountains are the quirky towns of Idyllwild and Mountain Center. Here you’ll find several campgrounds such as Hurkey Creek Campground, known for its 10-mile mountain bike course, Idyllwild County Park, featuring its own nature center, and Thousand Trails Idyllwild, offering amenities such as a pool, playground, and horseback riding. 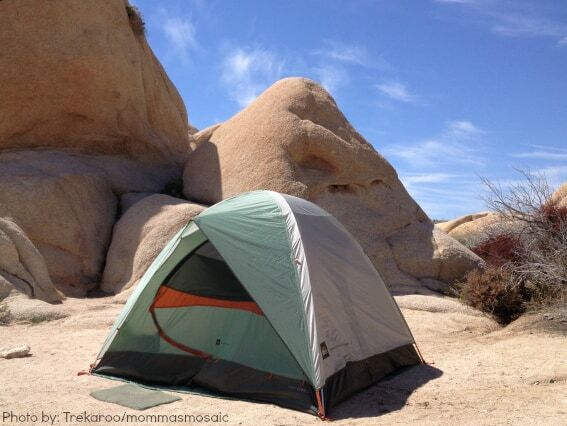 Looking for more places to camp in the Inland Empire? While the California deserts aren’t usually what comes to mind when people think of camping, they offer excellent options for stargazing, hiking, and exploring. California’s desert campgrounds are best experienced in non-summer months as temperatures easily rise above 100 degrees. Joshua Tree National Park has several incredible campgrounds perfect for families who want to experience a desert trip, enjoy bouldering, and hike some kid-friendly trails. Hidden Valley, Jumbo Rocks, and Indian Cove campgrounds are all excellent options. Meanwhile, in Death Valley National Park, families will love centrally located Furnace Creek campground. Check out more kid-friendly activities that shouldn’t be missed while camping in Death Valley National Park. Special thanks to Sharlene Earnshaw, LiLing Pang, Michelle McCoy, and Heather Reed for their contributions to this article.